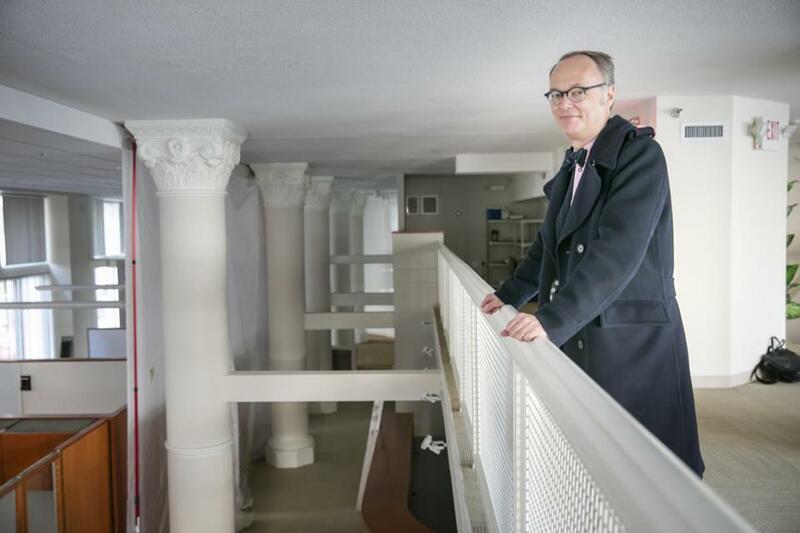 Former America’s Test Kitchen personality Christopher Kimball posed in the home of his new venture earlier this year. In a Suffolk Superior Court lawsuit, America’s Test Kitchen Inc. says Kimball “literally and conceptually ripped off” his old company. Christopher Kimball’s divorce from America’s Test Kitchen Inc. isn’t going to be an amicable one after all. The claim: The celebrity chef breached his trust with his former employer by building a new venture while still on the ATK payroll and using the company’s databases and recipes to position the venture, known as Milk Street, so it would directly compete with America’s Test Kitchen. Complicating matters: Kimball still owns a small minority stake in the company and appears in reruns of shows on public TV that were filmed before he left in November 2015. Scott Lashway, a lawyer who represents Kimball at the firm of Holland & Knight, declined to comment Monday, saying he hadn’t yet seen ATK’s lawsuit. This isn’t the first time that Kimball’s new venture has ended up in court. The founder of Milk Street Cafe, a restaurant and catering business in downtown Boston, filed a trademark lawsuit against Kimball’s new firm in July. At the time, Kimball’s new venture, opening this fall a few blocks away from the cafe, was known as Milk Street Kitchen. The Milk Street Cafe founder said he is moving ahead with his suit. Meanwhile, in the new lawsuit, America’s Test Kitchen contends that Kimball was drawing up plans for Milk Street long before his well-publicized departure from the company nearly a year ago. In particular, Bishop said the Milk Street magazine bears a striking resemblance to Cook’s Illustrated, right down to its 32-page size. Kimball had been with the firm since the early 1990s, and was there to launch Cook’s Illustrated in 1992. Bishop said Kimball acted as the company’s chief executive, although he never formally held that title. The company had grown quickly in recent years, more than doubling its work force since 2009 to roughly 200 people today. As a result, the ATK board sought to beef up its professional management structure, most notably through the hiring of David Nussbaum to be the new chief executive in mid-2015. ATK, in its suit, maintains that it wanted Kimball to stay on board under a new CEO and vigorously tried to keep him with the company. The lawsuit contends that Kimball spent the last year of his employment with the company creating a new venture while he “literally and conceptually ripped off America’s Test Kitchen.” The suit accuses Kimball of resenting giving up any control of the business and of engaging in a conspiracy to build a competing venture. It cites a litany of e-mails, uncovered through a recent forensic review, that show Kimball or people working on his behalf, seeking office space, obtaining media contact lists, and copying recipes without letting Kimball’s partners at ATK know. Bishop said the company is seeking some form of financial recompense and a change in the way Kimball is running Milk Street.